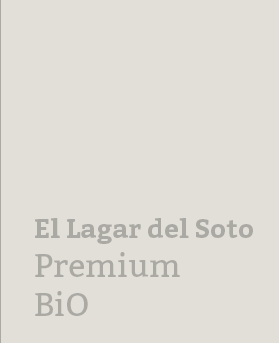 / El Lagar del Soto/ Gata-Hurdes PDO El Lagar del Soto Premium "Unique and unrepeatable"
PAIRINGS | GOOD WITH_ Wonderful drizzled over BREAD, in SAUCES and condiments such as mayonnaise; it enhances SALADS, FISH, VEGETABLES, soups, and stews. Its AROMA makes it the perfect accompaniment to add the finishing touch to a dish, and it may even surprise you in sauces and marinades for DESSERTS and FRUITS. 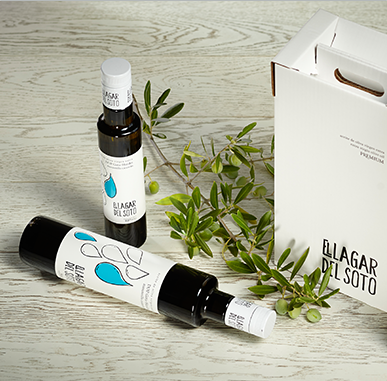 Gata-Hurdes PDO El Lagar del Soto Premium is our top quality extra virgin olive oil range produced from olives from olives trees registered in the Gata-Hurdes DOP (protected denomination of origin) that is part of the "Natura 2000 Network" of areas with special environmental protection. The Gata-Hurdes PDO is located in a privileged location in the north of the province of Cáceres, in the districts of Sierra de Gata, Las Hurdes, Trasierra-Tierras de Granadilla, Valle del Jerte, Valle del Ambroz, and part of the Valle del Alagón and La Vera (Extremadura). Its mild climate with abundant rains and its richly diverse vegetation give rich and diverse tastes to the olives used to produce this Premium product. ProcedentesThey are the result of traditional dryland cultivation and are produced from olives of the manzanilla cacereña variety. The fruits selected for these oils are harvested manually one by one by the ordeño method at the start of each season. 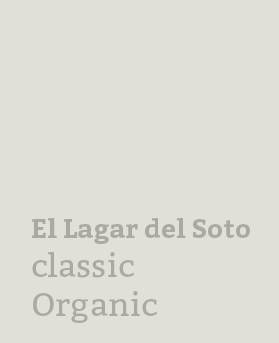 This pairing of manzanilla cacereña (the perfect variety) and its gathering by hand at just the right moment give this El Lagar de Soto Premium oil perfect organoleptic and chemical characteristics. 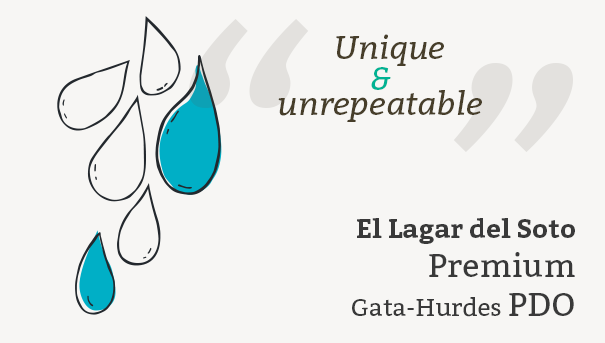 It is this together with its limited production that makes the Gata-Hurdes PDO El Lagar de Soto Premium a unique and unrepeatable oil that explodes on the palate with an incredible taste. Yellow with greenish hues, clean. A fruity, intense aroma to the nose of green olives, green grass, green almonds, other ripe fruits and nettle root, tomato and banana plant, and green wood with a touch of astringency. • Initially sweet in the mouth, slightly bitter and somewhat more spicy. A complex and delectable sensory experience. Non-refillable metal stopper according to legislation. EU P.D.O. (Gata-Hurdes Protected Denomination of Origin). “Alimentos de Extremadura” Brand Guarantee. Very high percentage of monounsaturated fats. 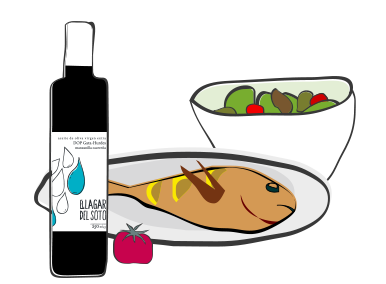 “Olive oil polyphenols contribute to the protection of blood lipids from oxidative stress”. “Vitamin E contributes to the protection of cells from oxidative stress”. 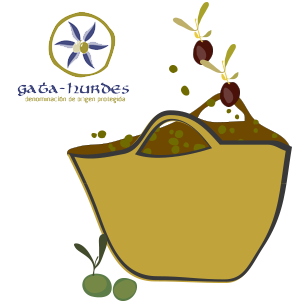 Regulatory council of the Gata-Hurdes Protected Denomination of Origin in the north of the province of Cáceres. Olisec Project. 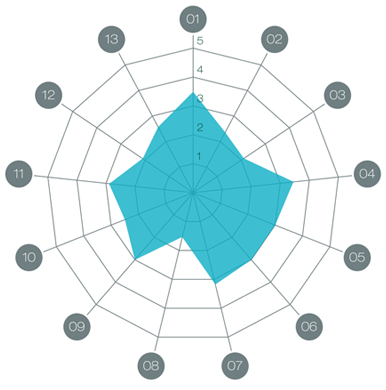 Seasons 11/12 Prepared by Jacoliva and CDTI of the Spanish Government. We produce aoves that are committed to the environment and to health. The Manzanilla Cacereña is a special olive owing to the limited area of its cultivation. Receive your order quickly by choosing either a 24h or 72h service. Your transactions offer security. We use the SSL Thawte encoded security system.